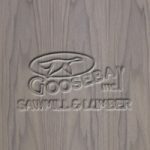 Walnut Plywood - Goosebay Sawmill and Lumber, Inc. This is walnut -veneered plywood. It is suitable for interior cabinetry applications. Sheet size is 4 feet by 8 feet. The appearance is plain-slice (the veneers are cut from the log in slices and laminated to have the appearance of boards). The core is veneer, which is structurally stronger than an MDF, or particle board, core. We are unable to do special orders for this product, the sizes that we have in stock are listed above. However, if you need large quantities please call or email for timing and pricing.